If you are flying from London City airport and would also like to take in the surrounding sights, then there is plenty for you and your family to enjoy whilst you wait. London City airport is located only six miles from the city of London, so youll be able to see some of the citys famous sights and take advantage of the array of cafes and restaurants. 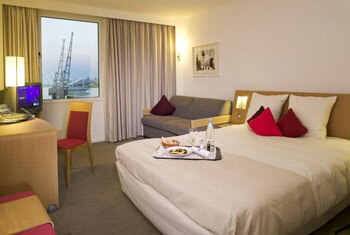 The Novotel is our London City airport hotel and is located in the Docklands and near to the O2 arena, Canary Wharf, Greenwich and Stratford. 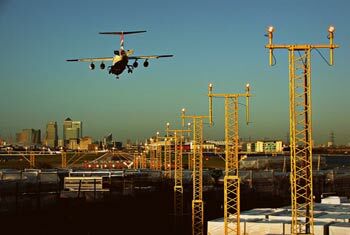 Where can I get something to eat and drink at London City airport? Landside at London City airport there is a Pret A Manger, where youll be able to enjoy a handmade sandwich and a hot drink before checking in. Once youve passed security, there is Bar TEN 28 which offers light snacks and takeaway food, Cafe Nero for fresh coffee, Trattoria, which seats up to 116 people and offers breakfast and a selection of hot dishes and also Presto, which serves fast, healthy food. Where can I shop at London City airport? There are a range of shops available after security at London City airport. You can choose from WHSmith, Travelex, Nuance and Gassan. What local attractions should I visit in London City? At Thames Cruises at Lambeth pier, youll be able to enjoy lunches and dinners, evenings parties and a fully licensed bar. Alternatively, you could venture to Tower Bridge, one of Londons most famous sights. The Tower Bridge Exhibition offers a great insight into the history of this landmark, and is only 5.3 miles away from the airport. The Porcupine Pub is a family-friendly pub with a large selection of alcoholic and non-alcoholic drinks and a big garden. It is only 4.6 miles from London City airport. The Beefeater restaurant is five miles away from the airport and serves both light meals and more filling dishes, so theres no need for you to fly hungry. The Water Poet is great for everyone and has a large garden, pool room, sheltered smoking area and a restaurant that becomes a bar in the evening. During the day the restaurant offers traditional English food in comfortable surroundings. The pub is also known for its wide range of beer, ales and cider and is easily reached at only 5.5 miles from the airport.